The WTFD firefighter trained on "Sim-Man" Tuesday. The training was provided free of charge by Cooper University Hospital (EMS Outreach). Firefighters practiced medical skills on these computer operated manikins. 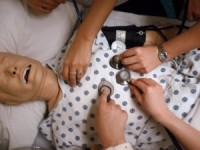 These manikins actually breath, talk, have blood pressures and even lung sounds.